One of the most popular group events, Broomball is a safe, fun activity played on a roughened ice surface in regular tennis shoes. Using a broom (the broom has actually evolved into a stick with a plastic handle), you play hockey with a plastic ball. The game is similar to soccer, but a lot more fun and a bit more challenging to those without a sure foot. 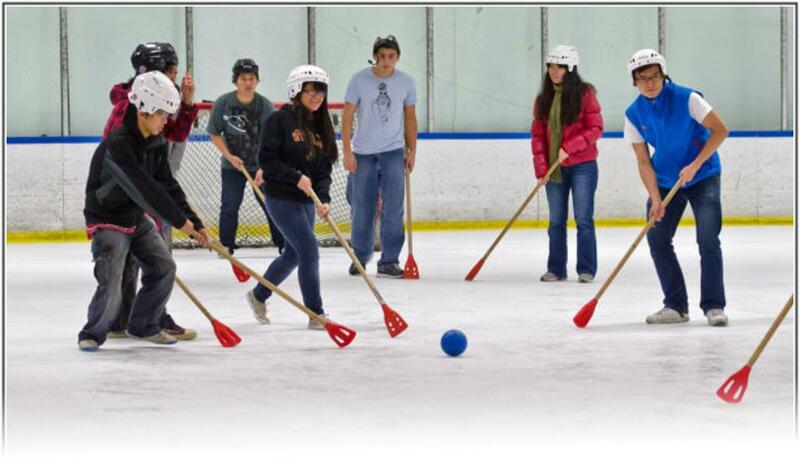 Broomball can be played by up to 50 participants at one time, making it an ideal, inexpensive activity for groups of nearly any size. Florida Panthers IceDen will provide you with all of the equipment and guidance to make your broomball event a success! Though the ice will be roughed up before the start of your game, there may still be some areas of smooth ice on the rink. Beware of these slick areas (usually marked by cones), and do not enter these areas at a pace greater than a walk. Injuries are likely to occur if you run into cone areas. If you do slip and start to fall backwards, tuck your chin down toward your chest. Do not turn your head. Sliding is dangerous to yourself and others, and is prohibited while playing. Sticks or brooms must be kept below the waist at all times. Kicking the broomball is illegal. However, you may use your foot to stop the ball. Broomballs above waist height can be stopped with the hands and dropped to the ice. Don't catch and throw the ball or bring your stick up. The only player who may handle or move the ball forward with the hands is the goalie. The goalie may move the ball forward as long as he keeps it below everyone's waist. Don't throw the ball over players' heads. Stay at least 5 feet away from the goalie as this person generally plays the position on his/her knees. Stick swinging around the goaltender is dangerous and should be avoided. Players MUST wear a helmet at all times. Kneepads, elbow pads and mouthpieces are recommended. Includes 1 hour for the game and equipment for up to 22 people at one time.